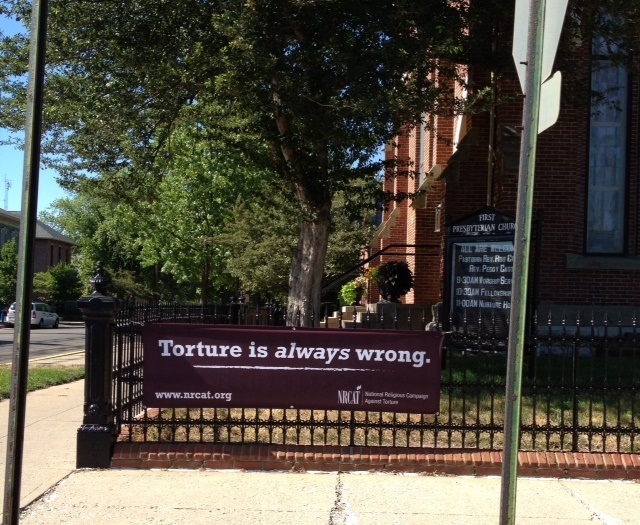 I saw this sign, “Torture is always wrong,” outside a Presbyterian church in Columbus, Indiana during my recent visit there. It can serve us well as a reminder that it is ten years ago this week since lawyers in the Bush Administration issued the “torture memos” justifying torture. This entry was posted in Civil rights, Foreign policy, History, Law, Politics and tagged Afghanistan, America, Barack Obama, George W. Bush, Guantanamo Bay, Iraq, Terrorism, Torture, Torture memos. Bookmark the permalink.